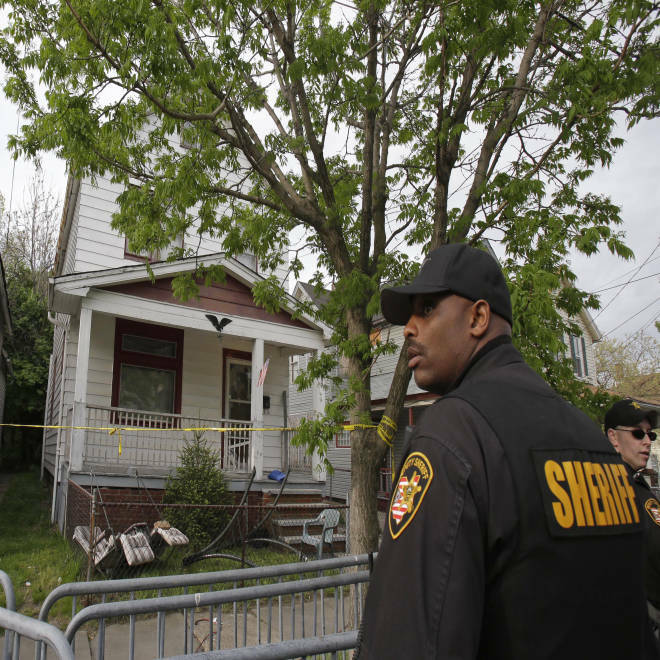 A sheriff's deputy stands outside the Cleveland house on May 7, 2013, where three missing women were found alive the day before. Tomba did promise that eventually, Knight's story "is going to come out." Police didn't look widely for Knight after they and social workers concluded that she ran off on her own because she was angry she had lost custody of her son, Deborah Knight, her grandmother, told the Plain Dealer of Cleveland on Monday. Knight's mother, Barbara Knight, told the newspaper that Michelle vanished shortly after she was scheduled for a court appearance in the custody case. Barbara Knight said she never bought the story that her daughter had run away and tirelessly kept searching for years. Even now, she told the newspaper, all she knows is coming from news reports, and she has doubts that the woman found Monday really is her daughter. "I'm praying that if it is her, she will come back with me, so I can help her recover from what she has been through," Barbara Knight said. "So much has happened in these 10 years. She has a younger sister she still has not met." Judy Martin, founder of the Cleveland advocacy group Survivors/ Victims of Tragedy, told NBC News that Knight simply "slipped through the cracks." "If it hadn't been for the families in these two cases, nothing would have been done," said Martin, who was active in the campaign to find DeJesus. Barbara Knight described a decade-long period of frustration with Cleveland police, with whom she filed a missing persons report and a photo years ago, only to see the information left out of news reports while the disappearances of Berry and DeJesus were widely covered. Barbara Knight said Michelle was the victim of an assault at school when she was 17. She said her daughter reported the incident to police but didn't think she was taken seriously. Soon after, Michelle got pregnant and dropped out of school, her mother said. Barbara Knight said she believed she saw her daughter once a few years ago at a Cleveland shopping center, being pulled by the arm by an older man. She told the Plain Dealer that she yelled Michelle's name, but the woman didn't respond. "I really miss her," she told the newspaper. "She was my daughter, but she was also my friend. She tried to make the best of her life and wanted to finish school. She never got the chance to go back." Gil Aegerter and Bill Dedman of NBC News contributed to this report. Follow M. Alex Johnson on Twitter and Facebook.